On September 20, 2017, the Diocese of La Crosse had the great honor of being one of the 12 locations in the United States to host the relics of Saint Padre Pio of Pietrelcina. This U.S. Fall tour celebrates the 130th anniversary of his birth, and the 15th anniversary of his canonization. 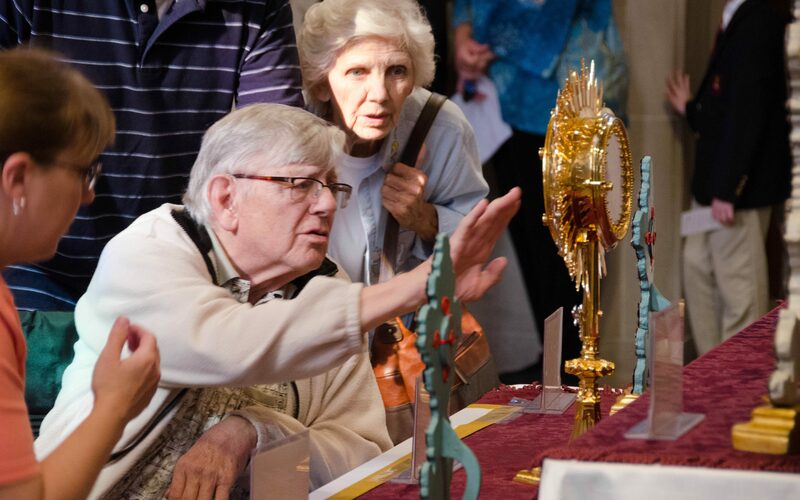 Pilgrims from across the diocese, the state and the nation travelled to venerate his relics at St. Joseph the Workman Cathedral in La Crosse. September 20th was a particularly auspicious occasion as it was the 99th anniversary of the day Saint Padre Pio received the stigmata, or wounds of Christ, on his hands and feet. Nearly 400 pilgrims per hour stood in a line, that often extended outside of the Cathedral, for the opportunity to venerate his relics. Many traveled hundreds of miles to take a few moments to pray, touch a rosary or memento to a relic, and ask for his intercession to receive healing for family members, friends or even themselves. Several of his relics were on display, including one of his glove, crusts of the wounds from his stigmata, Cotton-gauze with Saint Pio’s blood stains, his mantle and a handkerchief soaked with his sweat hours before his death. In the Catholic Church, relics are physical objects associated with a saint or candidate for sainthood – part of the person’s body or something with which he or she was in contact. Relics are not worshiped, but treated with religious respect. Touching or praying in the presence of such an object helps a person focus on the saint’s life and virtues, so that through the saint’s prayer or intercession before God, the individual will be drawn closer to God.